Starter Bakery, have I loved. So much so that I focused on them for my post last month at the Localwise blog. In it, I talk with owner Brian Wood about the wholesale bakery business, and just what he thinks makes his pastries and his employees stand out. For it, I got to try several of his overbakes, which were still quite delicious despite not quite being up to selling standards. Honestly, it was the first time I had ever ventured beyond the kouign amann that has brought Starter Bakery its local renown. It’s not mentioned in the article, but I think y’all should know that the triple ginger scone on that plate, buried beneath the kouign amann and a tasty blondie, was my favorite of all those wonders. 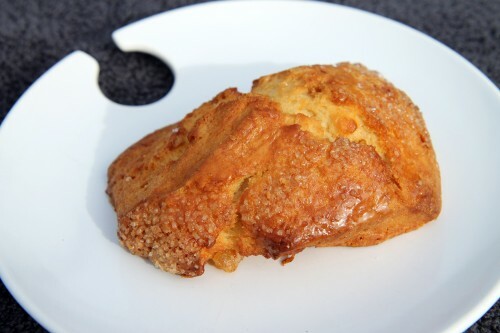 It took me a long time to warm up to ginger in cooking, and I’m still not that fond of candied ginger, but that scone managed to balance the root’s heat with just enough sugar to make me smile. Definitely try it next time you pass by a cafe or a farmers’ market in Oakland that offers Starter Bakery’s goods. Or perhaps you’d like this fruit danish instead? Yes, writing about Starter Bakery has only made me a bigger fan. There are worse results.